I made this project in order to build a cost effective surveillance car which can be controlled over the Internet or on any private network. This project was created on 05/26/2016 and last updated 3 years ago. I made this project in order to build a surveillance car which can be controlled over Internet or on any private network. My objective was to easily and cost effectively do something that can be used for security purposes. My car uses uses DTMF module which takes it’s input from mobile phone attached to the car, that mobile is not only used to generate DTMF tones but also for the surveillance by providing Live Footage from it’s camera, over the network using AirDroid. Conventionally, any project using DTMF requires call from another cell phone to the one attached to the project, which is not cost effective, but in case of my project I used an android app DTMF Tone Generator which generates DTMF tone now for this to work I shared my phone’s screen over the network using VNC server, hence cost effective. To make this Idea more effective I mounted the phone on a servo motor. This gave my Camera one degree of freedom, i.e. I can move it left and right without moving the bot. Generally, there is one more security problem involved with DTMF, that is, anyone can control the bot by calling the mobile phone attached to the bot. A simple solution to this problem was to apply a PIN using DTMF tones. I demonstrated this concept in the video and for the inner working you can check the source code. Far much more cheaper than the bluetooth and Wifi modules, with almost Identical working. Can be controlled via Internet using VPN. one can efficiently keep track on activities in his/her house when there are no occupants. It can be used for surveillance purposes in Dangerous areas where there is any kind of threat to human life. I used DTMF decoder module using MT8870DE and connected it to arduino as shown in circuit diagram. I pulled up(set on +5v) pin13 permanently so as to provide +5v to the module. As can be seen D1-D4 are connected to pin12-pin9 respectively, here D1 represents least significant bit and D4 represents most significant bit. 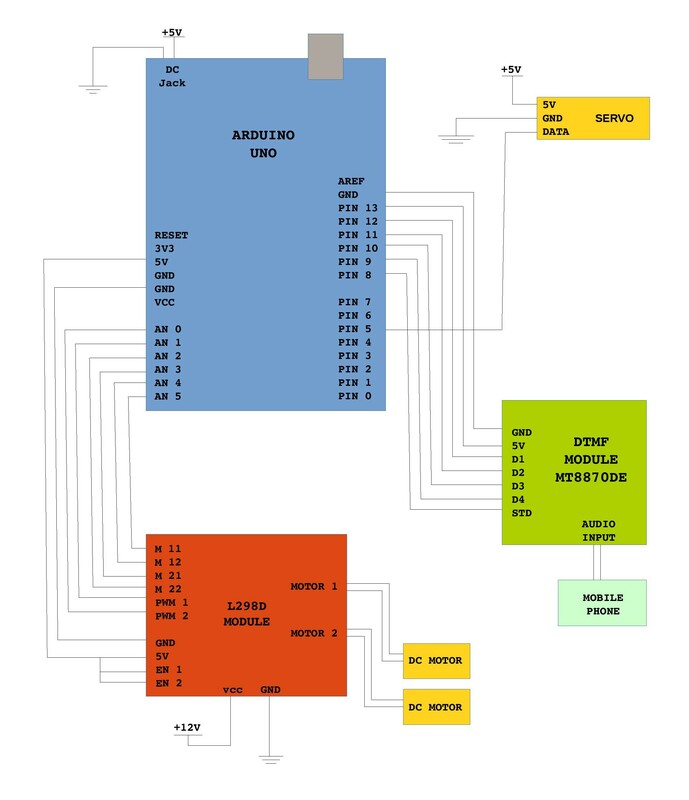 Pin8 of arduino is connected to STD pin of DTMF module, it becomes high whenever a new signal(valid tone) is given to module. Tones were generated via mobile phone and were fed as an input to DTMF decoder module using 3.5mm audio jack. For motor driver I used L298D module here M11, M12 and M21, M22 are connection for LEFT and RIGHT motor respectively, when car is seen from back to front. Car will move forward when M11=M21=HIGH and M12=M22=LOW. With this information you can easily use my source code directly by changing your connection respectively. PWM1 and PWM2 are the pins which can be used to control left and right motor&apos;s speed. I set both of them HIGH in order to attain maximum speed. EN1 and EN2 enables left and right motor when set high, so I shorted them with +5v supply from arduino. I connected Vdd for DC motors to a +12v supply. Phone was mounted on servo motor. Data pin of servo was connected to pin5 and +5v was taken from +5v supply and not from arduino as the current drawn by servo motor that I used exceeded the maximum current that could have been drawn from arduino. First of all I connected my laptop and my mobile phone to the same network. I used DTMF Tone Generator to generate DTMF tones. This application was running on my mobile phone. Now in order share the display and gain control over my mobile phone from my laptop I created a VNC server by running VNC server application on my phone in background and using VNC client on my laptop, now I was able to view my mobile phone&apos;s screen and simulated touches from my laptop. At this point I was able to generate DTMF tones from my mobile phone using my laptop, therefore I was able to control my car using my laptop. To get the live feed from my phone&apos;s camera I used AirDroid application, which was running in background alongside VNC server and using any browser(preferably Chrome) on my laptop I was able to use the camera of my phone. Source code is well documented, all the required explanation is given as comments. You are about to report the project "Surveillance Car Controlled via DTMF", please tell us the reason.